Not to be confused with vesicle (biology and chemistry). A vacuole (/ˈvækjuːoʊl/) is a membrane-bound organelle which is present in all plant and fungal cells and some protist, animal and bacterial cells. [verification needed] Vacuoles are essentially enclosed compartments which are filled with water containing inorganic and organic molecules including enzymes in solution, though in certain cases they may contain solids which have been engulfed. Vacuoles are formed by the fusion of multiple membrane vesicles and are effectively just larger forms of these. 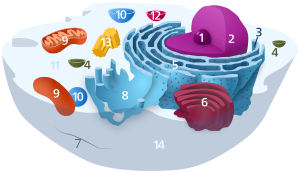 The organelle has no basic shape or size; its structure varies according to the requirements of the cell. By increasing in size, allows the germinating plant or its organs (such as leaves) to grow very quickly and using up mostly just water. In seeds, stored proteins needed for germination are kept in 'protein bodies', which are modified vacuoles. Vacuoles also play a major role in autophagy, maintaining a balance between biogenesis (production) and degradation (or turnover), of many substances and cell structures in certain organisms. They also aid in the lysis and recycling of misfolded proteins that have begun to build up within the cell. Thomas Boller and others proposed that the vacuole participates in the destruction of invading bacteria and Robert B. Mellor proposed organ-specific forms have a role in 'housing' symbiotic bacteria. In protists, vacuoles have the additional function of storing food which has been absorbed by the organism and assisting in the digestive and waste management process for the cell. The vacuole probably evolved several times independently, even within the Viridiplantae. Contractile vacuoles ("stars") were first observed by Spallanzani (1776) in protozoa, although mistaken for respiratory organs. Dujardin (1841) named these "stars" as vacuoles. In 1842, Schleiden applied the term for plant cells, to distinguish the structure with cell sap from the rest of the protoplasm. In 1885, de Vries named the vacuoule membrane as tonoplast. Large vacuoles are found in three genera of filamentous sulfur bacteria, the Thioploca, Beggiatoa and Thiomargarita. The cytosol is extremely reduced in these genera and the vacuole can occupy between 40–98% of the cell. The vacuole contains high concentrations of nitrate ions and is therefore thought to be a storage organelle. Gas vesicles, also known as gas vacuoles, are nanocompartments which are freely permeable to gas, and are present in some species of Cyanobacteria. They allow the bacteria to control their buoyancy. Most mature plant cells have one large vacuole that typically occupies more than 30% of the cell's volume, and that can occupy as much as 80% of the volume for certain cell types and conditions. Strands of cytoplasm often run through the vacuole. A vacuole is surrounded by a membrane called the tonoplast (word origin: Gk tón(os) + -o-, meaning “stretching”, “tension”, “tone” + comb. form repr. Gk plastós formed, molded) and filled with cell sap. Also called the vacuolar membrane, the tonoplast is the cytoplasmic membrane surrounding a vacuole, separating the vacuolar contents from the cell's cytoplasm. As a membrane, it is mainly involved in regulating the movements of ions around the cell, and isolating materials that might be harmful or a threat to the cell. Transport of protons from the cytosol to the vacuole stabilizes cytoplasmic pH, while making the vacuolar interior more acidic creating a proton motive force which the cell can use to transport nutrients into or out of the vacuole. The low pH of the vacuole also allows degradative enzymes to act. Although single large vacuoles are most common, the size and number of vacuoles may vary in different tissues and stages of development. For example, developing cells in the meristems contain small provacuoles and cells of the vascular cambium have many small vacuoles in the winter and one large one in the summer. Aside from storage, the main role of the central vacuole is to maintain turgor pressure against the cell wall. Proteins found in the tonoplast (aquaporins) control the flow of water into and out of the vacuole through active transport, pumping potassium (K+) ions into and out of the vacuolar interior. Due to osmosis, water will diffuse into the vacuole, placing pressure on the cell wall. If water loss leads to a significant decline in turgor pressure, the cell will plasmolyze. Turgor pressure exerted by vacuoles is also required for cellular elongation: as the cell wall is partially degraded by the action of expansins, the less rigid wall is expanded by the pressure coming from within the vacuole. Turgor pressure exerted by the vacuole is also essential in supporting plants in an upright position. Another function of a central vacuole is that it pushes all contents of the cell's cytoplasm against the cellular membrane, and thus keeps the chloroplasts closer to light. Most plants store chemicals in the vacuole that react with chemicals in the cytosol. If the cell is broken, for example by a herbivore, then the two chemicals can react forming toxic chemicals. In garlic, alliin and the enzyme alliinase are normally separated but form allicin if the vacuole is broken. A similar reaction is responsible for the production of syn-propanethial-S-oxide when onions are cut.
) are transported into the vacuole to isolate them from the rest of the cell. In animal cells, vacuoles perform mostly subordinate roles, assisting in larger processes of exocytosis and endocytosis. Animal vacuoles are smaller than their plant counterparts but also usually greater in number. There are also animal cells that do not have any vacuoles. Exocytosis is the extrusion process of proteins and lipids from the cell. These materials are absorbed into secretory granules within the Golgi apparatus before being transported to the cell membrane and secreted into the extracellular environment. In this capacity, vacuoles are simply storage vesicles which allow for the containment, transport and disposal of selected proteins and lipids to the extracellular environment of the cell. Endocytosis is the reverse of exocytosis and can occur in a variety of forms. Phagocytosis ("cell eating") is the process by which bacteria, dead tissue, or other bits of material visible under the microscope are engulfed by cells. The material makes contact with the cell membrane, which then invaginates. The invagination is pinched off, leaving the engulfed material in the membrane-enclosed vacuole and the cell membrane intact. Pinocytosis ("cell drinking") is essentially the same process, the difference being that the substances ingested are in solution and not visible under the microscope. Phagocytosis and pinocytosis are both undertaken in association with lysosomes which complete the breakdown of the material which has been engulfed. Salmonella is able to survive and reproduce in the vacuoles of several mammal species after being engulfed. Wikimedia Commons has media related to Vacuole. ^ Venes, Donald (2001). Taber's Cyclopedic Medical Dictionary (Twentieth Edition), (F.A. Davis Company, Philadelphia), p. 2287 ISBN 0-9762548-3-2. ^ a b Heide N. Schulz-Vogt (2006). "Vacuoles". Inclusions in Prokaryotes. Microbiology Monographs. 1. pp. 295–298. doi:10.1007/3-540-33774-1_10. ISBN 978-3-540-26205-3. ^ Brooker, Robert J, et al. (2007). Biology (First Edition), (McGraw-Hill, New York), p. 79 ISBN 0-07-326807-0. ^ Thomas Boller. Plantbiology.unibas.ch. Retrieved on 2011-09-02. ^ For example the food vacuole in Plasmodium. ^ Jezbera Jan; Karel Hornak; Karel Simek (2005). "Food selection by bacterivorous protists: insight from the analysis of the food vacuole by means of fluorescence in situ hybridization". FEMS Microbiology Ecology. 52 (3): 351–363. doi:10.1016/j.femsec.2004.12.001. PMID 16329920. ^ a b Becker B (2007). Function and evolution of the vacuolar compartment in green algae and land plants (Viridiplantae) (PDF). International Review of Cytology. 264. pp. 1–24. doi:10.1016/S0074-7696(07)64001-7. ISBN 9780123742636. PMID 17964920. ^ Dujardin, F. 1841. Histoire naturelle des zoophytes: Infusoires. Librairie Encyclopédique de Roret, Paris. ^ Wayne, R. 2009. Plant Cell Biology: From Astronomy to Zoology. Amsterdam: Elsevier/Academic Press, p. 101. ^ Kalanetra KM, Huston SL, Nelson DC (December 2004). "Novel, attached, sulfur-oxidizing bacteria at shallow hydrothermal vents possess vacuoles not involved in respiratory nitrate accumulation". Appl. Environ. Microbiol. 70 (12): 7487–96. doi:10.1128/AEM.70.12.7487-7496.2004. PMC 535177. PMID 15574952. ^ Walsby AE (1969). "The Permeability of Blue-Green Algal Gas-Vacuole Membranes to Gas". Proceedings of the Royal Society of London. Series B, Biological Sciences. 173 (1031): 235–255. Bibcode:1969RSPSB.173..235W. doi:10.1098/rspb.1969.0049. ISSN 0080-4649. JSTOR 75817. OCLC 479422015. ^ Alberts, Bruce, Johnson, Alexander, Lewis, Julian, Raff, Martin, Roberts, Keith, and Walter, Peter (2008). Molecular Biology of the Cell (Fifth Edition), (Garland Science, New York), p. 781 ISBN 978-0-8153-4111-6. ^ Li, WING-YEN; FUK-LING WONG; SAU-NA TSAI; TSUI-HUNG PHANG; GUIHUA SHAO; HON-MING LAM (June 2006). "Tonoplast-located GmCLC1 and GmNHX1 from soybean enhance NaCl tolerance in transgenic bright yellow (BY)-2 cells". Plant, Cell and Environment. 29 (6): 1122–1137. doi:10.1111/j.1365-3040.2005.01487.x. PMID 17080938. ^ D J Klionsky; P K Herman & S D Emr (1990). "The fungal vacuole: composition, function, and biogenesis". Microbiol. Rev. 54 (3): 266–292. PMC 372777. PMID 2215422. ^ William F. Ganong, MD (2003). Review of medical physiology (21st ed.). ^ Reggiori F (2006). "Membrane Origin for Autophagy". Current Topics in Developmental Biology Volume 74. Current Topics in Developmental Biology. 74. pp. 1–30. doi:10.1016/S0070-2153(06)74001-7. ISBN 9780121531744. PMID 16860663. ^ Leigh A. Knodler; Olivia Steele-Mortimer (2003). "Taking Possession: Biogenesis of the Salmonella-Containing Vacuole". Traffic. 4 (9): 587–599. doi:10.1034/j.1600-0854.2003.00118.x. PMID 12911813. This page was last edited on 9 April 2019, at 13:57 (UTC).